Sam was born in Quakertown, Pennsylvania, into a fundamental religious family with seven children. Sam’s father served as a preacher in the God’s Missionary Synod; his preaching took the family from state to state, and Sam attended 11 different schools. With four of his siblings becoming preachers, Sam’s early rebellion and his coming out as gay were not received well by the family. As a result, Sam chose “Equality” as his middle name. He became a gay activist, and in 1976 he met his partner of 42 years, Jim Zeigler. 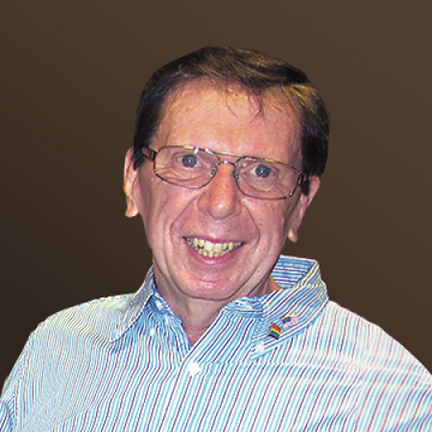 Sam worked with many gay activists in the 70s, then served on the Pennsylvania Council on Sexual Minorities. He founded the Susquehanna Valley Gays United in Sunbury and led a number of Pennsylvania’s rural gay organizations. Sam was an historian and saved as many gay-related papers and articles as he could gather. His papers were donated to the Central Pennsylvania LGBT History Project in 2017. Sam was honored at Dickenson College, Pennsylvania, where the papers are archived and also are exhibited, for the History Comes Out project. The exhibit includes a collection video of recorded LGBT stories, which currently is being viewed throughout Pennsylvania in a traveling exhibit, The Long Road to LGBTQ+ Equality in Pennsylvania. After more than 35 years in Pennsylvania, Sam and Jim moved to Delaware. Sam joined the Progressive Democrats of Sussex County, protesting in the circle of Georgetown at the “We Will Not Be Silent” rally supporting Coretta Scott King, Elizabeth Warren, and all women. He registered voters, got signatures for petitions, and marched in Delmar to promote the right to unionize nursing home staff, leading to the unionization. Sam was on a first-name basis with Delaware state legislators, championing progressive issues, and last July Fourth stood along Route One demonstrating against the separation of families at the US border. He worked with a coalition for the dreamers at Delaware State, and arranged a “Dine-In for Dreamers” benefit at Epworth United Methodist Church which raised over $5,000 to help the dreamers with textbooks and other costs associated with their education. Sam’s last effort, the African Freedom Project, raised funds to remove gay refugees from Gambia and Nigeria, where gays could be beheaded. His efforts, along with others in the group, raised enough money to free several refugees.